1. Lack of ability to think beyond the obvious. 2. Out of box thinking. Most act as “Frog of the Well” and their world ends there, no world exists beyond well walls. I guess this question demonstrates more of the frustration of business owner due to not being able to do beyond a point and lack of vision and inability to innovate. Off course innovation is not everyone’s cup of tea. My advise to people who are tired of own business would be to opt for open sourcing of innovative ideas to reinvent or scale up their business and taking it on the next level. There are plenty of online forums where by giving a brief synopsis of your business, you can get new ideas around your business. I am sure with world at your disposal to feed you with hundreds of ideas, you will find some pearls for yourself and to work upon further. This whole newness can bring the missing excitement and thrill in your business life. 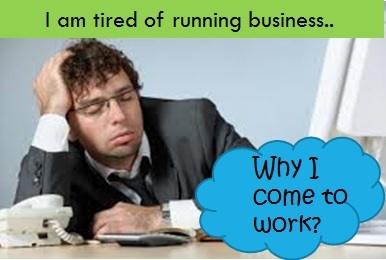 You can reinvent your business and can work tirelessly for few more years.